Wow an interesting story of the Tomb Raider Slot unfolds here… the year was 1996. The Spice Girls were top of the pops in Britain and Xena the Warrior Princess was waving broadswords about on American TV screens. As if she’d never even heard of health and safety regulations. Girl power was big, and the stage was set for the entrance of the gaming industry’s most popular and enduring leading lady: Lara Croft. Two movies and more video games than you can shake a poison-tipped spear at later. 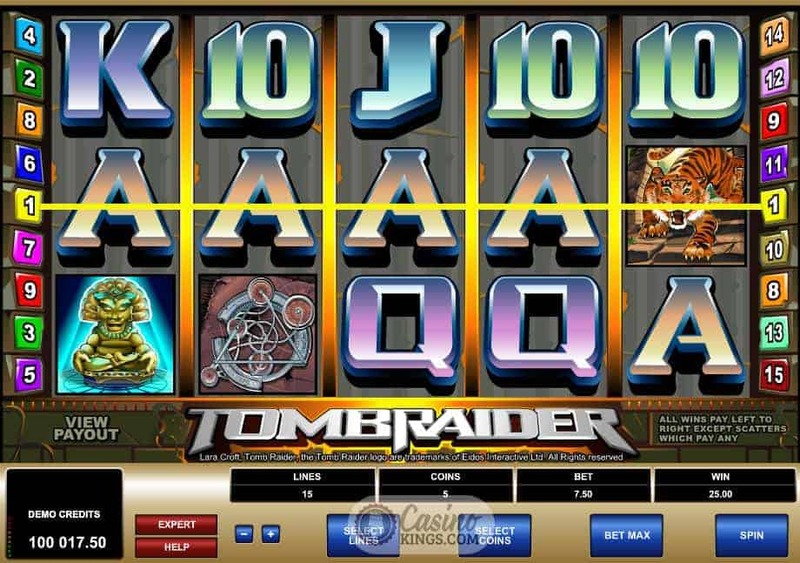 The Tomb Raider brand has finally made it to the world of online slots, courtesy of casino games giant Microgaming. 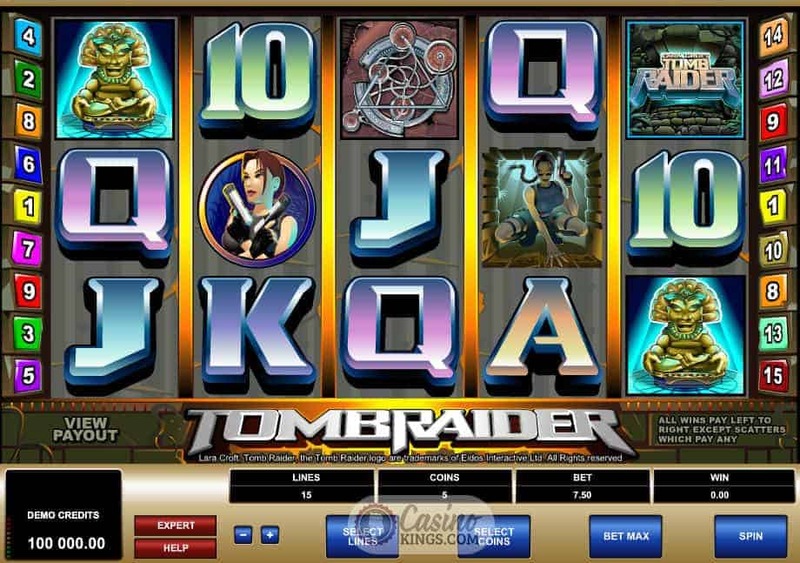 The first thing that strikes you as you begin to play Tomb Raider slots is the outstanding visual and audio design. 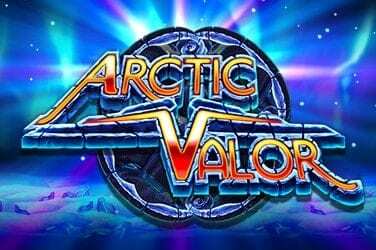 Deep rumblings punctuated by mysterious, lingering notes form the backing soundscape of the game, perfectly evoking the staple Tomb Raider settings of secret caverns and forgotten ruins. 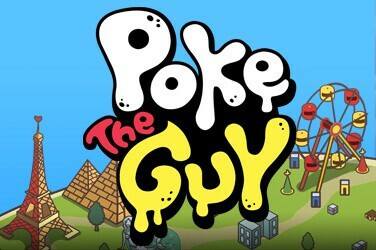 The game’s artwork is bright and clean, with a colourful, slightly cartoonish vibe. Naturally, Miss Croft features heavily across the five reels, crouching poised to pounce in one symbol. Brandishing her trademark twin pistols in another, and diving in silhouette across a third when a winning combination is made. 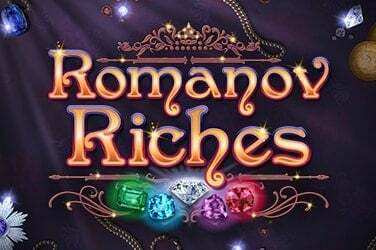 Prowling tigers, puzzling mechanisms and golden idols complete the look, alongside more traditional slot glyphs rendered as bright gemstones to tempt daring treasure hunters. Match three or more golden idols along any of the game’s 15 pay-lines to trigger a bonus mini-game and do a little tomb raiding of your own. This game places you in a secret chamber filled with golden idols and a classic dilemma. Which to take and which to leave? Like any true explorer will tell you, stuffing your pack with the right treasures is the key to your fortune. 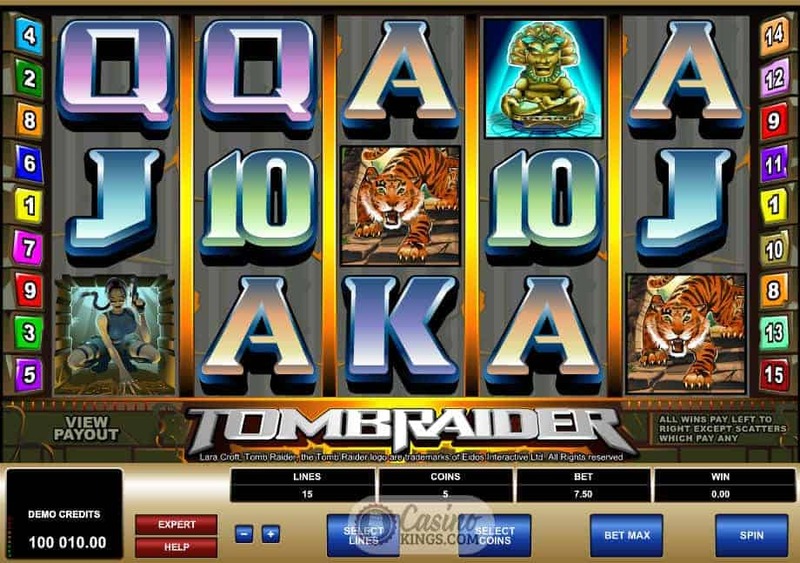 The Tomb Raider logo is the game’s wild symbol, and Microgaming have also included a free spins feature which offers big winning potential. 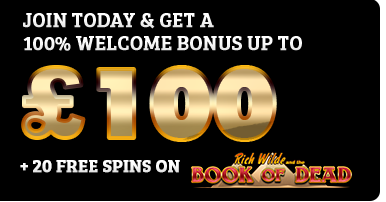 Scattering three or more Lara symbols anywhere on the board will net you ten free spins. 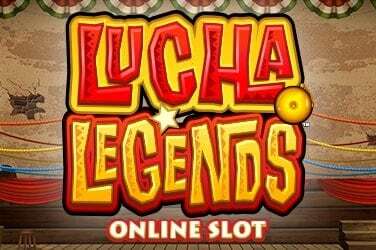 What’s more, any winning combinations you land with Lara’s free spins will pay triple. That’s the kind of pay-out that made her the world’s foremost archaeologist/ priceless-artefact-pincher. 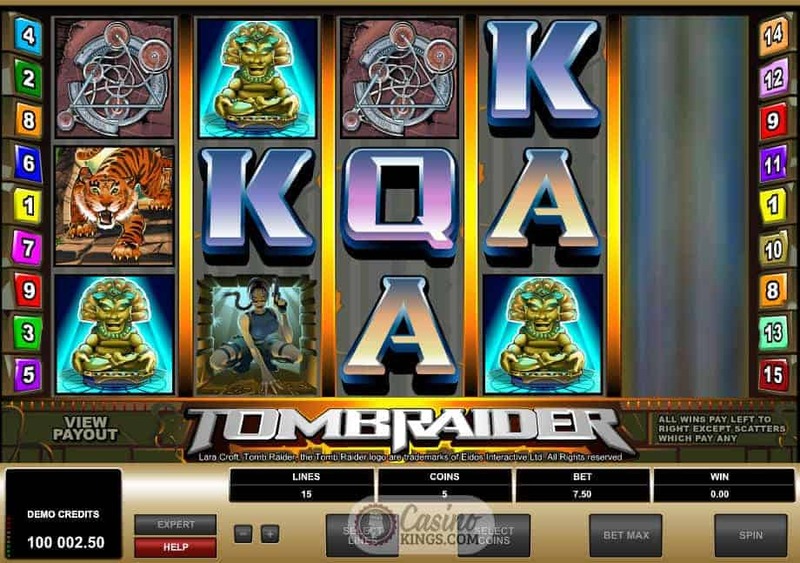 With sumptuous visuals, atmospheric sounds and feature-rich game-play, Tomb Raider slots is a treasure. Thankfully, it’s not the kind of treasure you have to crawl about in dark caves and fight tigers to get at – really, who has the time? No, Microgaming’s take on the Tomb Raider franchise is a better kind of treasure: the kind you can enjoy from your armchair. Top marks!